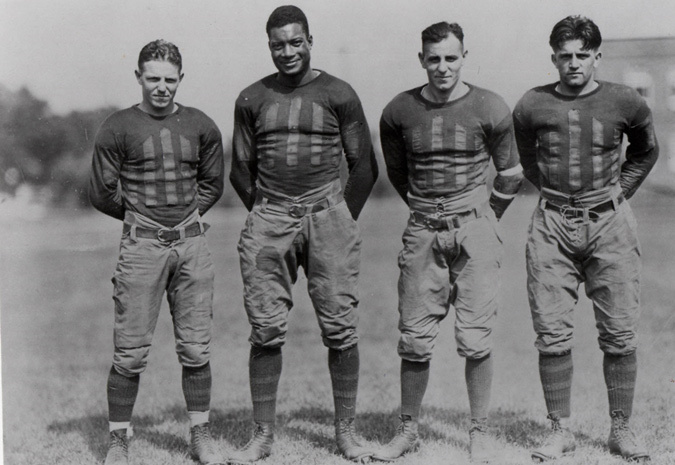 Jack Trice, Iowa State’s first Black football player, with teammates, 1923. 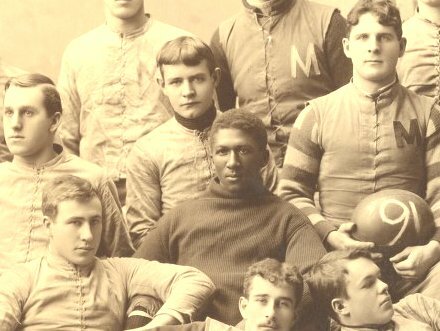 George Jewett, University of Michigan’s first African American football player, in an 1891 team photo. Old photos sometimes tell stories better than words. I think these pictures have extra relevance to how our country is evolving – in a positive way for a change. I’m always amazed by your find. I love these little mini-black history lessons…ooh. I just got back from a science blogging conference and I led the session on race/diversity in the sciences. One of the things we all discussed was using the power of blogging to share with others the diversity of the scientific community. Would you be interested in participating? It would fall naturally under your theme of higher education — perhaps sharing photos and bios of black math and science professors and first phds? Great photo finds, I like the history in them. Thanks for sharing those pictures…I love old pictures and pictures with history…. Thanks to all of you for dropping by on this Wordless Wednesday. Stan, I completely agree with you. Old photos can sometimes communicate thing that words just cannot say, especially at this moment of such monumental change. Hi Jams, thanks for the link. I really need to learn more about the history of Black people in the UK. It’s fascinating in the ways that that particular history is both similar and different from Black history in the U.S.
DNlee, I’m glad you enjoy my WW posts. I’m such a history buff, and I’m glad to get the change to share what I find. And i would definitely love to participate in the blogging project you describe. I’ll email you for more details. Thanks for letting me know about this. Tricia, thank you for looking. I just love the way photos have such a profound way of capturing historical moments, their dynamics and their mood. Sports and history, my two favorite subjects in school. I invite your blog readers to see a disturbing photo of suicide attempt at a national park. Why are people so willing to give up? I’m sure there’s are numerous articles on Jack Trice floating around academia, but he was one fascinating guy. One of the few post WWI players to die due to action in a football game. There is speculation that Minnesota targeted him during their game in ’23. If the date on that photo is correct the it was taken shortly before his death. ISU’s stadium is named after Jack Trice. Also Iowa State was never in the Big 10.